Put your ear to the ground and listen for Dirtbag, the militant mutant mole man. He’s a crazy coal miner and a mad mole all rolled into one. Dirtbag tunnels through sewers like a chisel through cheese. This mutant mole’s main mission is to seek out and destroy his arch enemy, Splinter. And sewer searchin’ can’t be easier with Dirtbag’s gear: a rancid rat pack and chisel knife. The sewers are sure to crumble under the weight of Dirtbag’s jack hammer gun – the deadliest pneumatic tool in the world! And Splinter better stop snoozin’ in his meditation chamber, ’cause Dirtbag’s got a mind-numbing 4-pointed pick. Nothing can stop this tunneling terror – not walls, not boulders – maybe not even the Turtles! So listen hard and listen long, for the next sound you hear could be Splinter splintering! Dirtbag is a mutant mole who first appears in the original cartoon. He and Groundchuck were created by Shredder but rebelled against him. 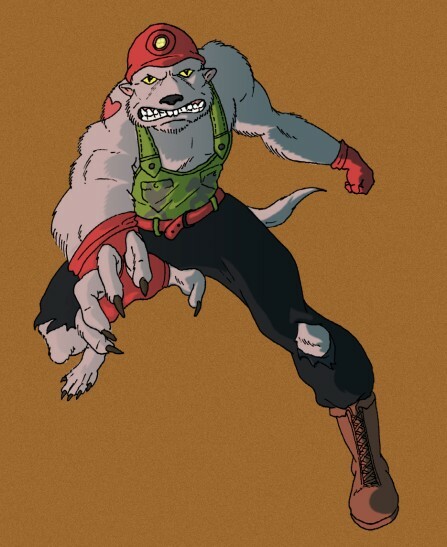 Dirtbag also appears in the video games, first appearing inTeenage Mutant Ninja Turtles III: The Manhattan Project as the fourth level boss. He later appeared in Teenage Mutant Ninja Turtles III: Radical Rescue as the second boss and later returns in the last level. He also appeared in Teenage Mutant Ninja Turtles 3: Shredder’s Last Stand as the fourth boss and later returns in the last level.